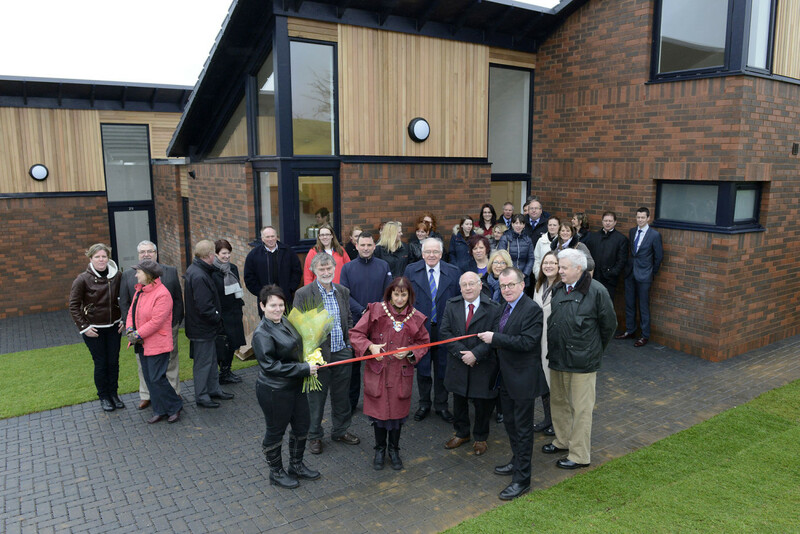 The Provost of South Ayrshire Helen Moonie has opened Ayrshire Housing’s latest development. The 13 new houses in Maybole enjoy splendid views towards the Southern Uplands. Provost Moonie said “I’m delighted with this the latest partnership between the Council, the Scottish Government and Ayrshire Housing. The houses have been carefully designed to meet the needs of the tenants and with energy efficiency in mind. The architects Austin-Smith:Lord and the builder Ashleigh (Scotland) have done an excellent job”. Councillor Moonie then presented flowers to Ms Andrea Corrin, one of the new tenants. Ms Corrin kindly invited the guests to view her three bedroom house. The site became available to the housing association through South Ayrshire Council’s planning policy on affordable housing. This requires all but the smallest private housing developments to include affordable housing, preferably new Council or housing association housing for rent. There are 9 two bedroom and 4 three bedroom houses. All have been designed to accommodate a range of needs. For example, all have a downstairs bath or shower room. They have also been built to be economical to heat with good quality day lighting. You can see plans of the houses here.